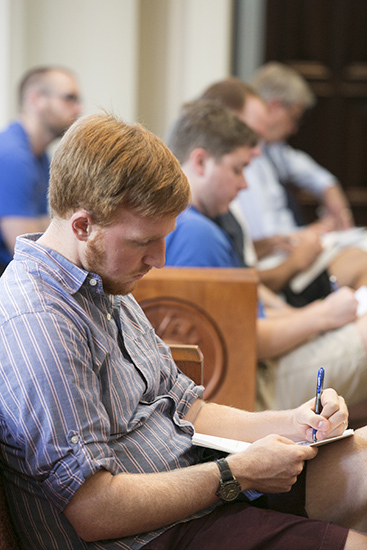 More than 140 faculty, staff, and students from Samford University’s Beeson Divinity School gathered in Andrew Gerow Hodges Chapel on Sept.15, for the first and only Finkenwalde Day. The day began with morning prayer and worship based on Psalm 119:1-24, followed by two lectures from divinity faculty: Piotr Malysz, “Being the Church in God’s World,” and Frank Thielman, “Justification and Ministry.” The traditional time of student mentoring groups provided an opportunity for more personal reflection and prayer. The 11 a.m. weekly chapel service included a message, “Vision Over Visibility,” based on Hebrews 4:1-4, by Professor of divinity Doug Webster, communion, the singing of African-American spirituals – a favorite of Bonhoeffer -- and a benediction sung in Hebrew of the Aaronic Benediction found in Numbers 6:22-26 by Rob Willis, divinity media and technology manager. Kristen Padilla is communications coordinator for Beeson Divinity School.